Cozy Bungalow With All Modern Comforts And Panoramic Ocean Views! Property 1: Cozy Bungalow With All Modern Comforts And Panoramic Ocean Views! Best Location!! Beautiful Home! Secure and a 3 Minute walk to the Surf! Property 6: Best Location!! Beautiful Home! Secure and a 3 Minute walk to the Surf! Property 8: Private Beach House Located at the Corner of Peace and Quiet ON THE BEACH!!! 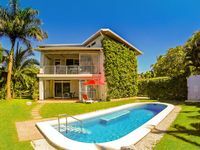 Property 9: PLAYA NEGRA - House in the heart of the tropical vegetation ! Why walk to the Beach. Casa De Memphis I is on the Beach. Monkeys included. Property 13: Why walk to the Beach. Casa De Memphis I is on the Beach. Monkeys included. Property 16: Contemporary hillside home overlooking the Pacific Ocean. Property 21: Oceanside – Lovely Home Just Steps to a Gorgeous Secluded Beach! Property 27: Cosy Cool Casita In Prime Location! Property 29: 3 MINUTE WALK TO PLAYA GUIONES, NOSARA, COSTA RICA! -FULLY SCREENED!!!!!! Oceanfront Tropical Paradise with AMAZING Pool! Property 35: Oceanfront Tropical Paradise with AMAZING Pool! Property 37: "Casa Bliss, a new modern home, close to surf and yoga." Property 41: Villa Infinity View: Brand New Home! Stunning views of the surf, mountains, and beaches! 5BR Brand New Luxury Home + Casita, Steps to the Surf, Sleeps 12! Property 49: 5BR Brand New Luxury Home + Casita, Steps to the Surf, Sleeps 12! Property 50: Villa Lola 1 : A Beautiful oasis in the heart of Playa Guiones! Our family of eight had a wonderful time. The owner was very responsive to any issues that occurred. The location is great, steps away from the beach and with great restaurants within walking distance. This property was easy for our family. The bedroom set up is perfect for a family of 4 or 5. Location was super. House was clean and well organized. Pool was super. I would rent there again in a moment.